I know I keep coming back to Bill Brand’s Masstransiscope, but there’s something about the piece I find irresistible. Perhaps its the ability for it to surprise jaded New Yorkers who suddenly find themselves watching an animated rocket ship blast off as the Q train passes by; perhaps it the creative use of an abanded subway station. Either way, even though I posted about its restoration a few days ago, I’m back again. This time around, we have a video from the MTA about the restoration. Bill Brand, the artist, speaks on the enduring timelessness of his subway zoetrope, and the video follows the restoration process. We see glimpses of the old Myrtle Ave. station and the panels en route to their rejuvenation as MTA workers get off a B train at the abandoned station. The historical center piece is a glimpse of the subways and the Masstransiscope in the mid-1980s. The system was a different beast back then. So take a gander at the short video above, and if you’re a fan of the Masstransiscope as I am, apparently you can get a mug. I’ll be back later on Thursday with some takes on a new and intriguing fantasy map for future subway routes as well as the mayoral candidates’ plans for mass transit investment and expansion. Arts For Transit hosted the auditions for the MTA’s Music Under New York program this morning, and the authority’s videographer has already produced a video from the day’s events. For my money, the best MUNY group around are the Ebony Hillbillies. The MTA’s decision in 2008 to axe the Poetry in Motion displays turned out to be a rather unpopular one. Weary straphangers who enjoyed the whimsy or thoughtfulness of the rhyming subway placards bemoaned the disappearances of the poems, and the Train of Thought project that placed it never took off. The MTA, along with the Poetry Society of America, announced today that the new program will be an expanded version of the old standby. 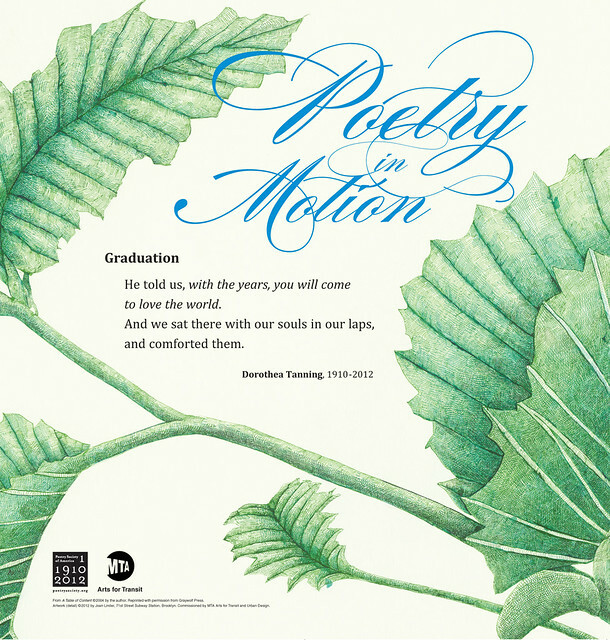 The poems will incorporate images from the authority’s extensive Arts for Transit collection and will be available on everywhere from subway car palcards to MetroCards to the travel bulletins posted in subway stations across the city. Within the subway cars, the decorated posters will be in the shape of a square at eye level rather than in the rectangular space reserved for overhead placards. The authority said it will release the next poem in April and then offer up two new ones each season. Three million MetroCards per quarter will come adorned with the poems as well, and that total represents approximately 11 percent of all MetroCards sold each quarter. For more on the return of Poetry in Motion, check out Cldye Haberman’s paean to program. Art at the new 63rd Street station will evoke the former Second Avenue elevated trains. I’ve been sitting on this one for a couple of weeks, but it’s still timely. A few weeks ago in The Wall Street Journal, Jennifer Maloney profiled my favorite under-the-radar MTA department. She highlighted the upcoming plans for art installations at the MTA’s new stations. Along the 7 line extension and underneath Second Ave., the authority will soon have four blank canvases, and they’re planning new art for each station. As subway riders descend the escalator into a new 7 line station near 10th Avenue and 34th Street in 2013, they will be followed by a mosaic of brightly colored celestial orbs shining from a deep blue sky. At a planned Second Avenue subway stop at 63rd Street, the walls will display photographs evoking the elevated trains that once rumbled above. 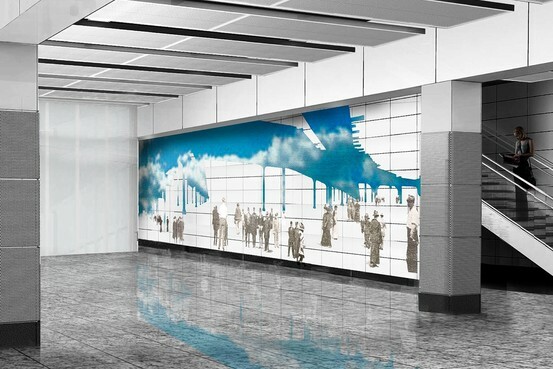 And a station at 96th Street will feature line drawings fired onto ceramic tiles, playing with perspectives as travelers move through the space. The designs are part of the Metropolitan Transportation Authority’s plan to make each of its new subway stations on the extended 7 line and new Second Avenue line a massive work of public art. Building on the MTA’s nearly three-decade history of enlivening subway and commuter rail stations with mosaics and sculpture, the agency has commissioned art that accompanies riders from the sidewalk to the platform and helps shape spaces that haven’t yet been built. As Maloney notes, the MTA allocates a small portion of the construction costs to artwork. The new installations are expected to cost between $900,000 and a $1 million each and are a part of projects that will cost a few billion dollars each. It’s a great program that livens up the subways, turning them into the city’s most extensive art gallery. Check out Maloney’s piece for more renderings of the upcoming art. Jean Shin’s work at 63rd St., which, according to Maloney, will “depict the 1942 dismantling of the Second Avenue elevated line and the opening of the sky over an area accustomed to rumbling and shadows,” sounds particularly intriguing. I wonder how many transit systems can say they are home to two life-sized zoetropes. While Manhattan-bound riders on the B and Q have long spied the Masstransiscope just east of the Manhattan Bridge, straphangers passing through Union Square can now marvel at the world’s largest digital linear zoetrope. As part of a temporary Arts for Transit installation, the MTA along with a professor from Parsons the New School of Design and his students unveiled “Union Square in Motion” earlier this week. 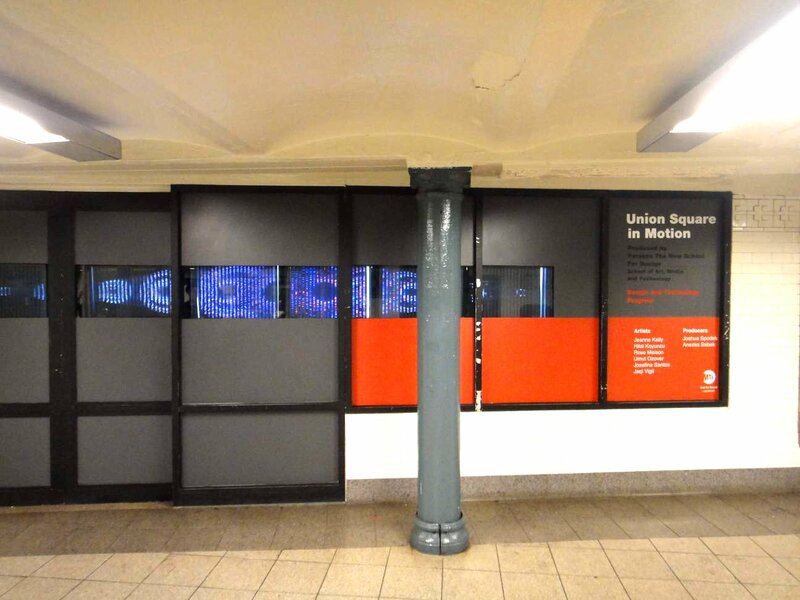 Consisting of abstract and organic images, the scenes move as subway riders walk past the display. 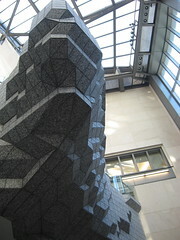 The installation is similar to a project designer Joshua Spodek and his team installed in Bryant Park last year. “When you see two strangers stop to look then start talking to each other, amazed at the art they’re seeing in the subway, you realize what art can do to create community and draw people together,” Spodek said. At ground level at the new Atlantic Ave. Terminal, Allen and Ellen Wexler’s “Overlook” inspires an outdoor pause. (Photo by Benjamin Kabak. Grand train terminals have long been prime people-watching areas. The buildings are alive with those who scurry to and from trains, those who are waiting for friends and loved ones to arrive, those counting down the minutes until they can head home and those simply enjoying a public space. Stepping back to observe the pace of life in motion is one of the pleasures of commuting life. Early last week, I took a tour of the building and spoke to the artists behind the “Overlook,” a granite-and-glass installation that brings a sense of calm and tranquility to an otherwise busy building. It is, in the words of Allen Wexler, half of the husband-and-wife team behind the piece, supposed to represent “the intersection between nature and city” in an urban environment. The artists, pictured above, talked to me about their design process and the inspiration for the piece. The two of them worked closely with John di Domenico, the architect behind the new terminal building, to construct something that would seem both natural for the terminal but also unique for the space. It is a site-specific installation meant to evoke a scenic overlook at a national park, and it transforms the upper level into a spot for simply watching urban nature. In the end, the MTA hopes that their new installation creates a meeting space at the station as well. With over 25,000 LIRR passengers and 31,000 subway travelers passing through the new terminal each day, the “Overlook” is ready to become a local landmark. “This vantage point was created as a collaborative effort combining our design that placed the wall between two sweeping stairways and the artists’ vision of morphing that structural wall into an outcropping of rocks,” di Domenico said. Hanging above the ticket area, the waiting room and two grand staircases, it’s bound to become the terminal’s prime people-watching spot as well. Taking a walk through the Columbus Circle station right now is one of the least pleasant experiences in the subway. Undergoing a complete rehab that is behind schedule, the station is hot and dusty. Platforms are cut off; walls are exposed; staircases are closed. Eventually, the station will be completely transformed, but for now, it is in a perpetual state of construction. On Wednesday, a glimpse of color appeared amidst the construction as the Sol LeWitt Arts for Transit installation opened on a double-wide wall on a mezzanine in between the A/B/C/D and 1 train platforms. The piece, shown above and again at the bottom of the post, was commissioned in 2004, and LeWitt, who passed away two years ago, selected the site himself. The work is 53 feet wide by 11 feet tall and is made of 250 porcelain tiles of six varying colors. It is called “Whirls and twirls (MTA)” and is one of the more vibrantly-colored entries in the Arts for Transit program. 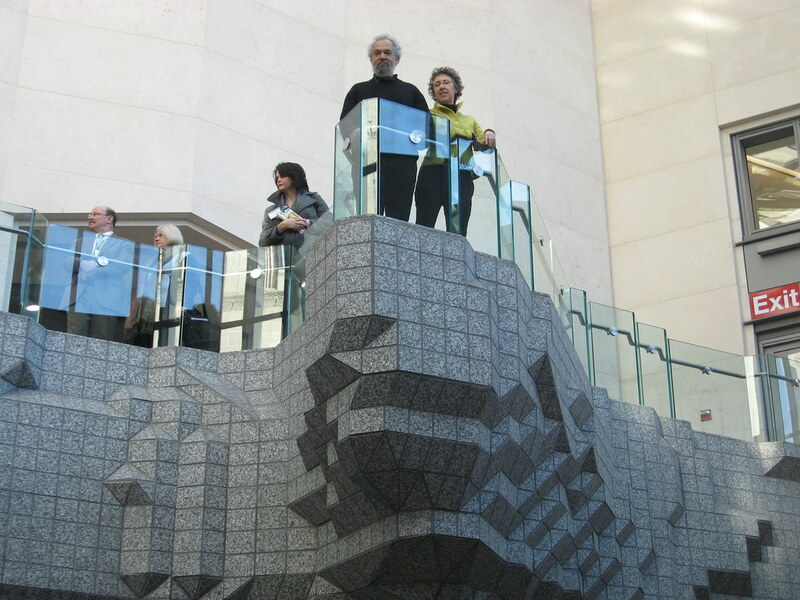 Sadly, LeWitt is no longer with us to see the piece’s grand unveiling. He died in April 2007, but the artist is enjoying much posthumous success. As his obituary says, LeWitt was known for “deceptively simple geometric sculptures and drawings and ecstatically colored and jazzy wall paintings.” An exhibit of his works, recently named one of the top art shows in the nation, is on display for 25 years at Mass MoCA in North Adams, Massachusetts, and LeWitt was very much looking forward to his collaboration with the MTA. “When an artist uses a conceptual form of art, it means that all of the planning and decisions are made beforehand and the execution is a perfunctory affair. The idea becomes a machine that makes the art,” he said in an Arts for Transit interview a year before his death. While some may criticize Arts for Transit as a superfluous use of money in tight economic times, LeWitt’s piece brings some color and levity to our normally serious commutes. 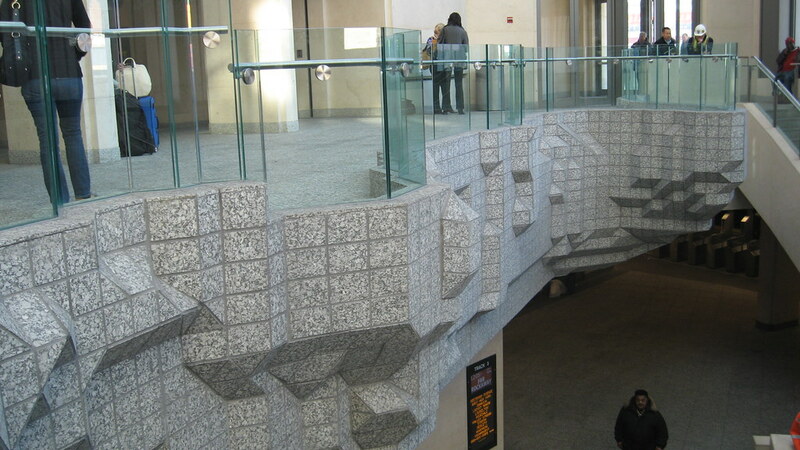 It lightens up a once-dull space and should be recognized and embraced as a leading example of underground art. Arguably the definitive book on musical performance in the spaces of public transportation, Underground Harmonies: Music and Politics in the Subways of New York, by Susie Tanenbaum, presents an insightful and fascinating portrayal of the culture of music that has existed for decades in the stations of New York’s subway, adroitly drawing research techniques from urban anthropology, sociology, social history, cultural studies, constitutional law, political theory, urban planning, folklore, and urban ecology. Earlier this week I met with Ms. Tanenbaum in her office at Queens Borough Hall and had the opportunity to ask her about Underground Harmonies and the work she has been doing on behalf of local musicians and artists since the book’s completion. It’s been nearly 15 years since Underground Harmonies was published. Are you happy with the book’s reception? At the risk of sounding cliché, writing Underground Harmonies was an absolute labor of love. It meant a lot to me to be able to write about subway music as this incredibly special public space phenomenon, one that makes a difference to countless people as they go through their daily urban routine, one that legitimates the subways as a cultural venue, one that places value on subjective experience, and one that encourages people – complete strangers – to communicate across ethnic/racial boundaries without the need for advertising or other corporate packaging. It’s gratifying to know that UH was the first book written about NYC subway music; 15 years later, I’m thrilled to get contacted from time to time by researchers (like you) and documentarians. Do you think it had an effect on conversations about public transportation and the arts? I’m not sure I can gauge UH’s impact on conversations about public transportation and the arts. In January, I was invited to speak at a national transportation conference, and I was told that this was the first time the association (with membership in the tens of thousands) had organized a panel on arts in transit. Maybe work like mine, and yours, will become more relevant as transit experts and mavens pay more & more attention to aesthetics. The Know Your Rights Guide that I wrote after the book, in collaboration with City Lore: The Center for Urban Folk Culture, which is now on City Lore’s web site, may have had a greater impact on conversations between subway performers and police. Have you noticed any changes in the situation of live musical performance in the New York subways in the past fifteen years? The truth is, I don’t spend as much time in the subways as I did in the 1990s. But my own impression, and that of some of my friends, is that there isn’t as much live music in the subways as there used to be. If not, why not? Maybe it’s because subway music is no longer a novelty, and musicians have moved on to other venues and callings. Or maybe it’s because many transit police officers are still under the impression that the MTA’s Music Under NY members are the only ones who have a legal right to perform underground, so they (the transit police) shut down the freelancers. In reality, all performers, whether freelance or MUNY, have a constitutional right to perform in subway stations. Steve Zeitlin from City Lore has been getting a lot of emails lately from freelance musicians who say that the transit police have told them they’re not allowed to perform on subway platforms. Unless the MTA/NYCT rules were amended recently, this is untrue. It’s strange…. Rudy Giuliani was a bully, obsessed with Police Commissioner Bill Bratton’s “broken windows theory” and determined to render our public spaces orderly by clearing out any meaningful human activity. But Mike Bloomberg is quite different. He really values public art, and in the summers he organizes these vehicle-free Saturdays to encourage people to come out and engage in all kinds of spontaneous play. Is this a situation where the sentiments of the folks in charge haven’t trickled down to what’s happening on the ground in the subways? Is it a situation where the priorities of the NYCT (getting people from point A to point B) conflict with the priorities of the Mayor & the MTA (making public spaces hospitable)? Or is it a situation where spontaneous play only matters when the city schedules a day for it – in other words, does the city still either not trust or not care very much about spontaneous, freelance street and subway performances? How did you initially get interested in musical performance and doing an ethnographic study of people in the subway? I enrolled in the Urban Studies Master’s program at Queens College-CUNY in the late 1980s, mainly to study with Dr. Roger Sanjek, an urban anthropologist who was doing fieldwork at the time in Elmhurst and Corona, Queens, the epicenter of the new immigration to New York at the time. Roger and his team were documenting the relationships between long-time residents and recent immigrants, and I deeply appreciated his approach to understanding the multiple layers of race relations in our borough and city. I arranged to do an independent study with Roger and, for reasons that remain unconscious to me, I wanted to explore how traditional music helped new immigrants to settle into their new society. After a few attempts at visiting particular communities in this part of Queens, Roger asked me why I don’t write instead about the guys I’d become friends with who were playing music in the subways. I’d been getting to know the members of Antara, one of the first Andean bands underground. I took Roger’s advice, and with guidance from another professor, Candance Kim Edel, I continued my fieldwork for the next four years. It became my Master’s thesis, then Roger helped me to get my work published by Cornell University Press. I’m still good friends with some of the original members of Antara. If you were to republish the book today, what changes would you make? Truthfully, I don’t think I could write the same book today. For one thing, transit police officers and NYCT employees probably wouldn’t grant me interviews as they did back then. Whether it’s post-911 security or a general trend toward bureaucratizing & controlling information, it seems our government agencies prefer not to have researchers document the subjective experiences of their employees. I really hope I’m wrong about this. In any event, if I were to write the book today, I would certainly include copies of the questionnaires that I used (the New York Times criticized me for leaving them out!). I’d love to know if people have suggestions on what else to include in a book like this! What other projects have you been working on since you wrote the book? In the 1990s I worked as Program Director and later Associate Director of the Jackson Heights Community Development Corporation. Among other things, I started LACE, the Local Arts Collaborative & Exchange, a network of 60 – 100 visual, literary and performing artists. Together we organized exhibits, concerts, readings & Open Mics throughout western Queens. Several of the members & my co-organizers were subway musicians. Currently I work for Queens Borough President Helen Marshall, and two of my areas of responsibility are immigrant and inter-cultural affairs. I plan cultural heritage events with various religious and ethnic communities in the borough, and I organize cross-cultural dialogues, which still often incorporate music. I really enjoy bringing people together across cultural lines and creating spaces in which they build relationships; to me, this is a quiet but meaningful form of political empowerment, one that I actually get to do out of a political office (because I have a wonderful boss who is an integrationist and a veteran of the civil rights movement)! On the side, Steve Zeitlin and I are in touch with subway musicians and we’re hoping to revive what we call our Street Performers Advocacy Project. I’ll keep you posted on that.